Everybody knows the first 3 digits of the Rydberg constant, Ry≈13.6 eV, but actually it is experimentally known with the fantastic accuracy of 0.006 ppb, and the electron-to-atom mass ratio has also been determined precisely. Thus the measurement of the cesium mass can be translated into a 0.2 ppb measurement of the fine structure constant: 1/α=137.035999046(27). Experimentally, ge is one of the most precisely determined quantities in physics, with the most recent measurement quoting ae = 0.00115965218073(28), that is 0.0001 ppb accuracy on ge, or 0.2 ppb accuracy on ae. In the Standard Model, ge is calculable as a function of α and other parameters. In the classical approximation ge=2, while the one-loop correction proportional to the first power of α was already known in prehistoric times thanks to Schwinger. The dots above summarize decades of subsequent calculations, which now include O(α^5) terms, that is 5-loop QED contributions! Thanks to these heroic efforts (depicted in the film For a Few Diagrams More - a sequel to Kurosawa's Seven Samurai), the main theoretical uncertainty for the Standard Model prediction of ge is due to the experimental error on the value of α. The Berkeley measurement allows one to reduce the relative theoretical error on ae down to 0.2 ppb: ae = 0.00115965218161(23), which matches in magnitude the experimental error and improves by a factor of 3 the previous prediction based on the α measurement with rubidium atoms. If you're a member of the Holy Church of Five Sigma you can almost preach an unambiguous discovery of physics beyond the Standard Model. However, for most of us this is not the case yet. 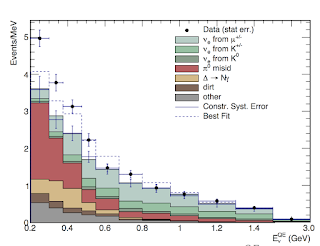 First, there is still some debate about the theoretical uncertainties entering the muon g-2 prediction. Second, while it is quite easy to fit each of the two anomalies separately, there seems to be no appealing model to fit both of them at the same time. Take for example the very popular toy model with a new massive spin-1 Z' boson (aka the dark photon) kinetically mixed with the ordinary photon. In this case Z' has, much like the ordinary photon, vector-like and universal couplings to electron and muons. But this leads to a positive contribution to g-2, and it does not fit well the ae measurement which favors a new negative contribution. 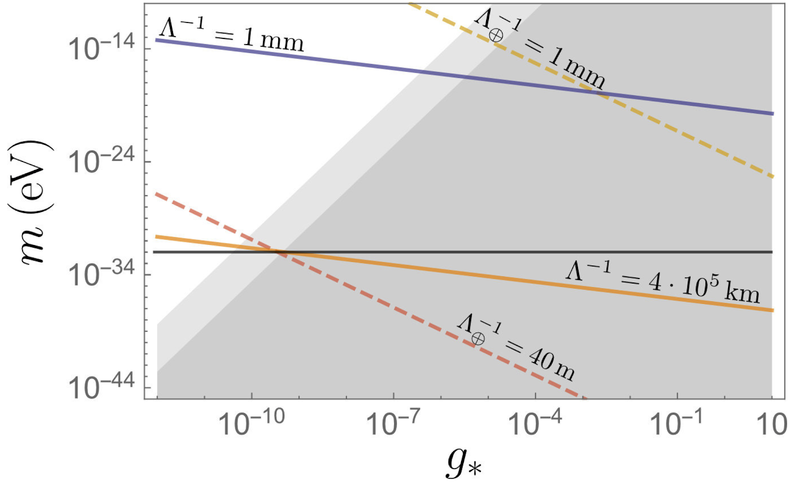 In fact, the ae measurement provides the most stringent constraint in part of the parameter space of the dark photon model. 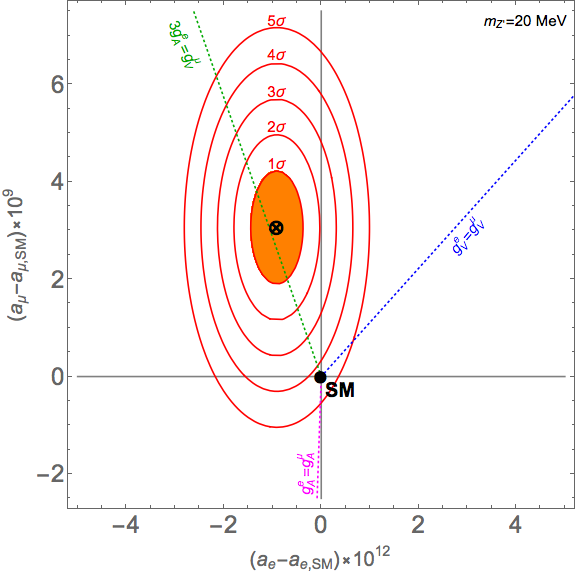 Conversely, a Z' boson with purely axial couplings to matter does not fit the data as it gives a negative contribution to g-2, thus making the muon g-2 anomaly worse. What might work is a hybrid model with a light Z' boson having lepton-flavor violating interactions: a vector coupling to muons and a somewhat smaller axial coupling to electrons. But constructing a consistent and realistic model along these lines is a challenge because of other experimental constraints (e.g. from the lack of observation of μ→eγ decays). Some food for thought can be found in this paper, but I'm not sure if a sensible model exists at the moment. If you know one you are welcome to drop a comment here or a paper on arXiv. WIMP can be loosely defined as a dark matter particle with mass in the 1 GeV - 10 TeV range and significant interactions with ordinary matter. Historically, WIMP searches have stimulated enormous interest because this type of dark matter can be easily realized in models with low scale supersymmetry. Now that we are older and wiser, many physicists would rather put their money on other realizations, such as axions, MeV dark matter, or primordial black holes. Nevertheless, WIMPs remain a viable possibility that should be further explored. 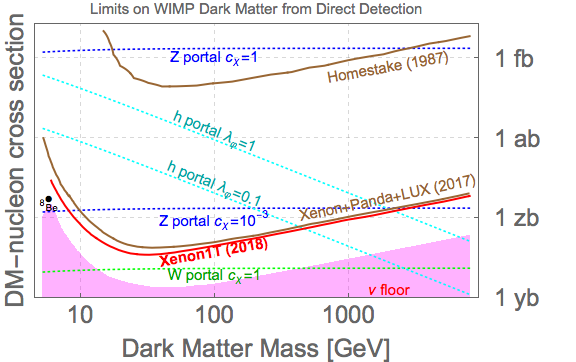 To detect WIMPs heavier than a few GeV, currently the most successful strategy is to use huge detectors filled with xenon atoms, hoping one of them is hit by a passing dark matter particle. Xenon1T beats the competition from the LUX and Panda-X experiments because it has a bigger gun tank. Technologically speaking, we have come a long way in the last 30 years. XENON1T is now sensitive to 40 GeV WIMPs interacting with nucleons with the cross section of 40 yoctobarn (1 yb = 10^-12 pb = 10^-48 cm^2). This is 6 orders of magnitude better than what the first direct detection experiment in the Homestake mine could achieve back in the 80s. Compared to the last year, the limit is better by a factor of two at the most sensitive mass point. At high mass the improvement is somewhat smaller than expected due to a small excess of events observed by XENON1T, which is probably just a 1 sigma upward fluctuation of the background. What we are learning about WIMPs is how they can (or cannot) interact with us. Of course, at this point in the game we don't see qualitative progress, but rather incremental quantitative improvements. One possible scenario is that WIMPs experience one of the Standard Model forces, such as the weak or the Higgs force. The former option is strongly constrained by now. If WIMPs had interacted in the same way as our neutrino does, that is by exchanging a Z boson, it would have been found in the Homestake experiment. 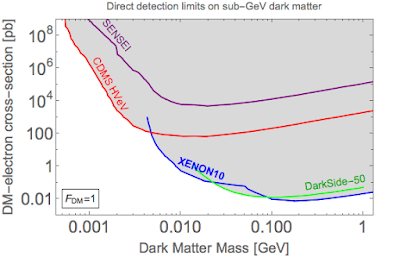 Xenon1T is probing models where the dark matter coupling to the Z boson is suppressed by a factor cχ ~ 10^-3 - 10^-4 compared to that of an active neutrino. On the other hand, dark matter could be participating in weak interactions only by exchanging W bosons, which can happen for example when it is a part of an SU(2) triplet. In the plot you can see that XENON1T is approaching but not yet excluding this interesting possibility. 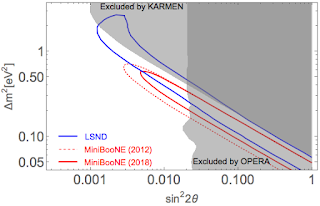 As for models using the Higgs force, XENON1T is probing the (subjectively) most natural parameter space where WIMPs couple with order one strength to the Higgs field. And the arms race continues. The search in XENON1T will go on until the end of this year, although at this point a discovery is extremely unlikely. 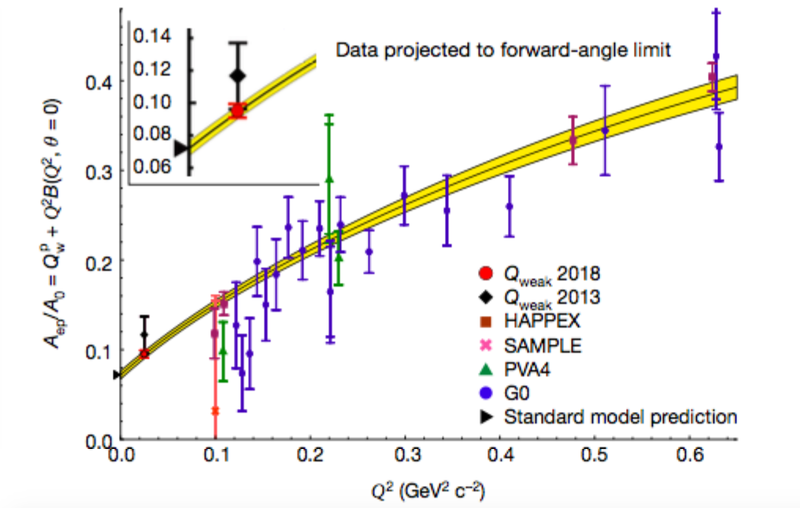 Further progress is expected on a timescale of a few years thanks to the next generation xenon detectors XENONnT and LUX-ZEPLIN, which should achieve yoctobarn sensitivity. DARWIN may be the ultimate experiment along these lines, in the sense that there is no prefix smaller than yocto it will reach the irreducible background from atmospheric neutrinos, after which new detection techniques will be needed. For dark matter mass closer to 1 GeV, several orders of magnitude of pristine parameter space will be covered by the SuperCDMS experiment. Until then we are kept in suspense. Is dark matter made of WIMPs? And if yes, does it stick above the neutrino sea? In the particle world the LHC still attracts the most attention, but in parallel there is ongoing progress at the low-energy frontier. A new episode in that story is the Qweak experiment in Jefferson Lab in the US, which just published their final results. Qweak was shooting a beam of 1 GeV electrons on a hydrogen (so basically proton) target to determine how the scattering rate depends on electron's polarization. Electrons and protons interact with each other via the electromagnetic and weak forces. The former is much stronger, but it is parity-invariant, i.e. it does not care about the direction of polarization. On the other hand, since the classic Wu experiment in 1956, the weak force is known to violate parity. Indeed, the Standard Model postulates that the Z boson, who mediates the weak force, couples with different strength to left- and right-handed particles. The resulting asymmetry between the low-energy electron-proton scattering cross sections of left- and right-handed polarized electrons is predicted to be at the 10^-7 level. That has been experimentally observed many times before, but Qweak was able to measure it with the best precision to date (relative 4%), and at a lower momentum transfer than the previous experiments. where v ≈ 246 GeV, and QW is the so-called weak charge of the proton. Such interactions arise thanks to the Z boson in the Standard Model being exchanged between electrons and quarks that make up the proton. 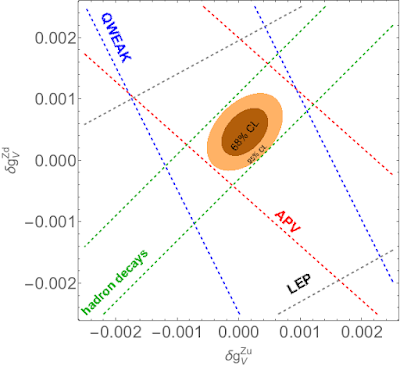 At low energies, the exchange diagram is well approximated by the contact term above with QW = 0.0708 (somewhat smaller than the "natural" value QW ~ 1 due to numerical accidents making the Z boson effectively protophobic). 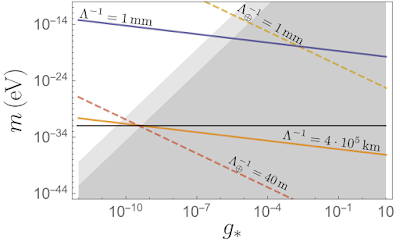 The measured polarization asymmetry in electron-proton scattering can be re-interpreted as a determination of the proton weak charge: QW = 0.0719 ± 0.0045, in perfect agreement with the Standard Model prediction. where M* is the mass scale of new particles beyond the Standard Model, and g* is their coupling strength to matter. Thus, Qweak can constrain new weakly coupled particles with masses up to a few TeV, or even 50 TeV particles if they are strongly coupled to matter (g*～4π). From the size of the rotten egg region you see that the Z boson couplings to light quarks are currently known with a per-mille accuracy. Somewhat surprisingly, the LEP collider, which back in the 1990s produced tens of millions of Z boson to precisely study their couplings, is not at all the leader in this field. 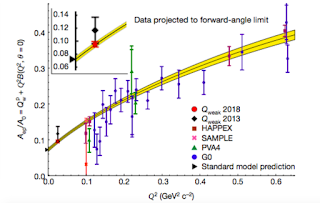 In fact, better constraints come from precision measurements at very low energies: pion, kaon, and neutron decays, parity-violating transitions in cesium atoms, and the latest Qweak results which make a difference too. The importance of Qweak is even more pronounced in more complex scenarios where the parameter space is multi-dimensional. Qweak is certainly not the last salvo on the low-energy frontier. Similar but more precise experiments are being prepared as we read (I wish the follow up were called SuperQweak, or SQweak in short). Who knows, maybe quarks are made of more fundamental building blocks at the scale of ~100 TeV, and we'll first find it out thanks to parity violation at very low energies. It must have been great to be a particle physicist in the 1990s. Everything was simple and clear then. They knew that, at the most fundamental level, nature was described by one of the five superstring theories which, at low energies, reduced to the Minimal Supersymmetric Standard Model. Dark matter also had a firm place in this narrative, being identified with the lightest neutralino of the MSSM. This simple-minded picture strongly influenced the experimental program of dark matter detection, which was almost entirely focused on the so-called WIMPs in the 1 GeV - 1 TeV mass range. 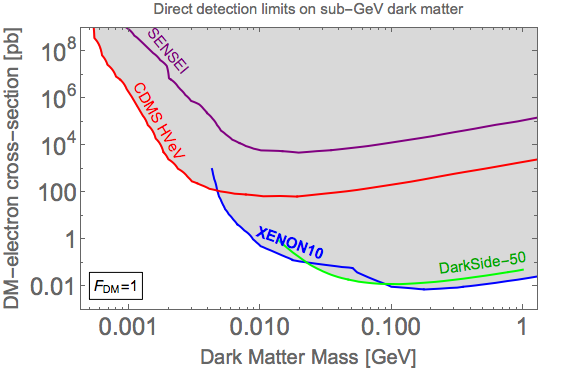 Most of the detectors, including the current leaders XENON and LUX, are blind to sub-GeV dark matter, as slow and light incoming particles are unable to transfer a detectable amount of energy to the target nuclei. Sometimes progress consists in realizing that you know nothing Jon Snow. The lack of new physics at the LHC invalidates most of the historical motivations for WIMPs. Theoretically, the mass of the dark matter particle could be anywhere between 10^-30 GeV and 10^19 GeV. There are myriads of models positioned anywhere in that range, and it's hard to argue with a straight face that any particular one is favored. We now know that we don't know what dark matter is, and that we should better search in many places. If anything, the small-scale problem of the 𝞚CDM cosmological model can be interpreted as a hint against the boring WIMPS and in favor of light dark matter. For example, if it turns out that dark matter has significant (nuclear size) self-interactions, that can only be realized with sub-GeV particles. It takes some time for experiment to catch up with theory, but the process is already well in motion. There is some fascinating progress on the front of ultra-light axion dark matter, which deserves a separate post. Here I want to highlight the ongoing developments in direct detection of dark matter particles with masses between MeV and GeV. Until recently, the only available constraint in that regime was obtained by recasting data from the XENON10 experiment - the grandfather of the currently operating XENON1T. In XENON detectors there are two ingredients of the signal generated when a target nucleus is struck: ionization electrons and scintillation photons. WIMP searches require both to discriminate signal from background. But MeV dark matter interacting with electrons could eject electrons from xenon atoms without producing scintillation. In the standard analysis, such events would be discarded as background. 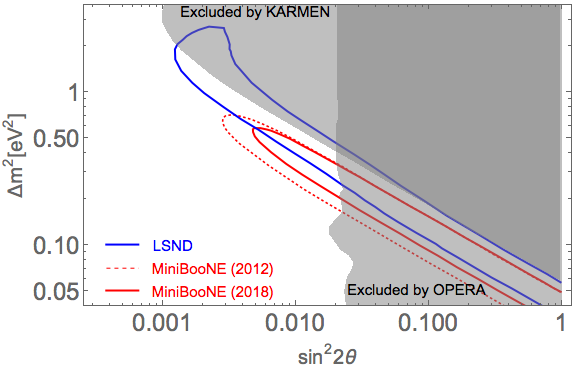 However, this paper showed that, recycling the available XENON10 data on ionization-only events, one can exclude dark matter in the 100 MeV ballpark with the cross section for scattering on electrons larger than ~0.01 picobarn (10^-38 cm^2). 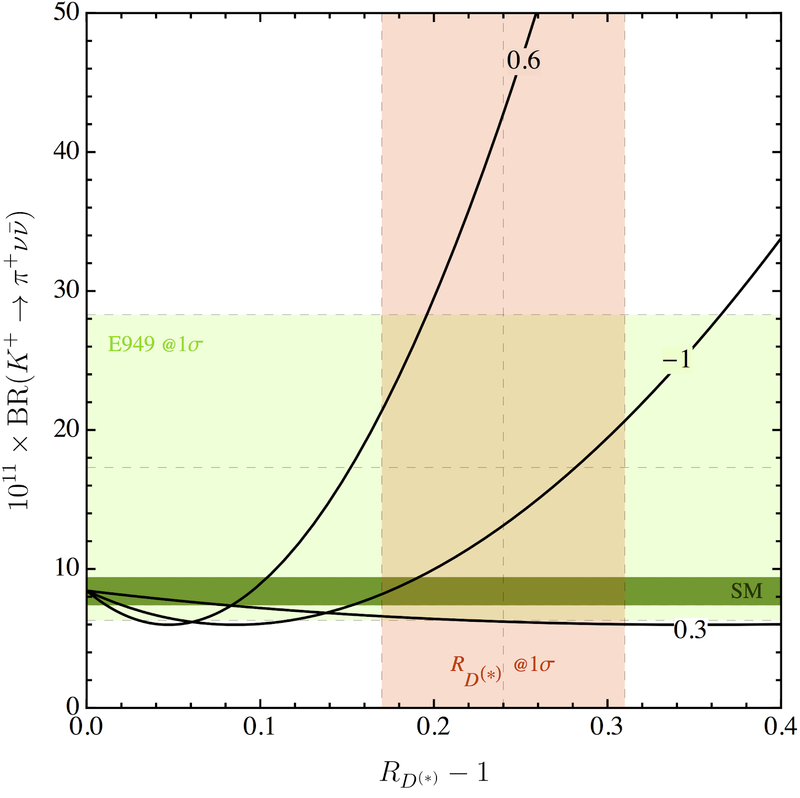 This already has non-trivial consequences for concrete models; for example, a part of the parameter space of milli-charged dark matter is currently best constrained by XENON10. It is remarkable that so much useful information can be extracted by basically misusing data collected for another purpose (earlier this year the DarkSide-50 recast their own data in the same manner, excluding another chunk of the parameter space). Nevertheless, dedicated experiments will soon be taking over. Recently, two collaborations published first results from their prototype detectors: one is SENSEI, which uses 0.1 gram of silicon CCDs, and the other is SuperCDMS, which uses 1 gram of silicon semiconductor. Both are sensitive to eV energy depositions, thanks to which they can extend the search region to lower dark matter mass regions, and set novel limits in the virgin territory between 0.5 and 5 MeV. A compilation of the existing direct detection limits is shown in the plot. As you can see, above 5 MeV the tiny prototypes cannot yet beat the XENON10 recast. But that will certainly change as soon as full-blown detectors are constructed, after which the XENON10 sensitivity should be improved by several orders of magnitude. Should we be restless waiting for these results? Well, for any single experiment the chance of finding nothing are immensely larger than that of finding something. Nevertheless, the technical progress and the widening scope of searches offer some hope that the dark matter puzzle may be solved soon. Proving Einstein wrong is the ultimate ambition of every crackpot and physicist alike. In particular, Einstein's theory of gravitation - the general relativity - has been a victim of constant harassment. That is to say, it is trivial to modify gravity at large energies (short distances), for example by embedding it in string theory, but it is notoriously difficult to change its long distance behavior. At the same time, motivations to keep trying go beyond intellectual gymnastics. For example, the accelerated expansion of the universe may be a manifestation of modified gravity (rather than of a small cosmological constant). The second coming was heralded soon after by Vainshtein, who noticed that the troublesome polarization-0 mode can be shut off in the proximity of stars and planets. This can happen in the presence of graviton self-interactions of a certain type. Technically, what happens is that the polarization-0 mode develops a background value around massive sources which, through the derivative self-interactions, renormalizes its kinetic term and effectively diminishes its interaction strength with matter. See here for a nice review and more technical details. Thanks to the Vainshtein mechanism, the usual predictions of general relativity are recovered around large massive source, which is exactly where we can best measure gravitational effects. The possible self-interactions leading a healthy theory without ghosts have been classified, and go under the name of the dRGT massive gravity. So the massive gravity theory in its usual form cannot be used at distance scales shorter than ～300 km. For particle physicists that would be a disaster, but for cosmologists this is fine, as one can still predict the behavior of galaxies, stars, and planets. While the theory certainly cannot be used to describe the results of table top experiments, it is relevant for the movement of celestial bodies in the Solar System. Indeed, lunar laser ranging experiments or precision studies of Jupiter's orbit are interesting probes of the graviton mass. 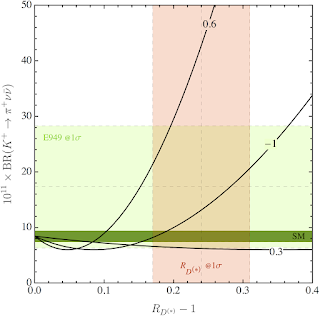 Massive gravity must live in the lower left corner, outside the gray area excluded theoretically and where the graviton mass satisfies the experimental upper limit m～10^−32 eV. This implies g* ≼ 10^-10, and thus the validity range of the theory is some 3 order of magnitude lower than 𝞚max. In other words, massive gravity is not a consistent effective theory at distance scales below ～1 million km, and thus cannot be used to describe the motion of falling apples, GPS satellites or even the Moon. In this sense, it's not much of a competition to, say, Newton. Dead for the second time. Is this the end of the story? For the third coming we would need a more general theory with additional light particles beyond the massive graviton, which is consistent theoretically in a larger energy range, realizes the Vainshtein mechanism, and is in agreement with the current experimental observations. This is hard but not impossible to imagine. Whatever the outcome, what I like in this story is the role of theory in driving the progress, which is rarely seen these days. In the process, we have understood a lot of interesting physics whose relevance goes well beyond one specific theory. So the trip was certainly worth it, even if we find ourselves back at the departure point. NA62 is a precision experiment at CERN. From their name you wouldn't suspect that they're doing anything noteworthy: the collaboration was running in the contest for the most unimaginative name, only narrowly losing to CMS... NA62 employs an intense beam of charged kaons to search for the very rare decay K+ → 𝝿+ 𝜈 𝜈. The Standard Model predicts the branching fraction BR(K+ → 𝝿+ 𝜈 𝜈) = 8.4x10^-11 with a small, 10% theoretical uncertainty (precious stuff in the flavor business). 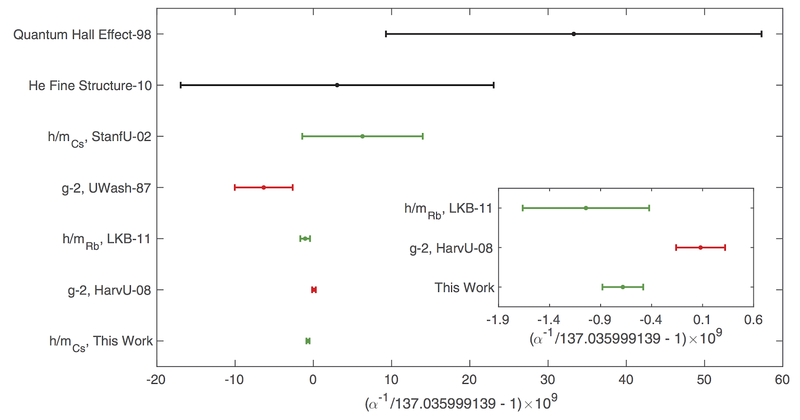 The previous measurement by the BNL-E949 experiment reported BR(K+ → 𝝿+ 𝜈 𝜈) = (1.7 ± 1.1)x10^-10, consistent with the Standard Model, but still leaving room for large deviations. 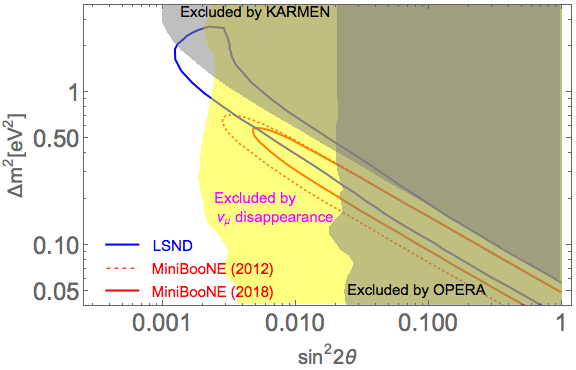 NA62 is expected to pinpoint the decay and measure the branching fraction with a 10% accuracy, thus severely constraining new physics contributions. The wires, pipes, and gory details of the analysis were nicely summarized by Tommaso. Let me jump directly to explaining what is it good for from the theory point of view. The mass scale suppressing this interaction is quite large, more than 1000 times larger than the W boson mass, which is due to the loop factor and small CKM matrix elements entering the amplitude. The strong suppression is the reason why the K+ → 𝝿+ 𝜈 𝜈 decay is so rare in the first place. The corollary is that even a small new physics effect inducing that effective interaction may dramatically change the branching fraction. Even a particle with a mass as large as 1 PeV coupled to the quarks and leptons with order one strength could produce an observable shift of the decay rate. In this sense, NA62 is a microscope probing physics down to 10^-20 cm distances, or up to PeV energies, well beyond the reach of the LHC or other colliders in this century. If the new particle is lighter, say order TeV mass, NA62 can be sensitive to a tiny milli-coupling of that particle to quarks and leptons. The observable RD(*) parametrizes the preference for B → D 𝜏 𝜈 over similar decays with electrons and muon, and its measurement by the BaBar collaboration deviates from the Standard Model prediction by roughly 3 sigma. 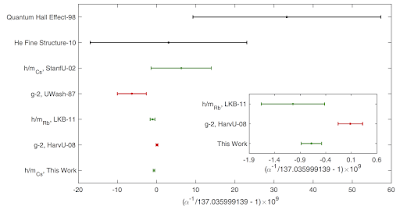 The plot shows that, in a model based on U(2)xU(2) flavor symmetry, a significant contribution to RD(*) generically implies a large enhancement of BR(K+ → 𝝿+ 𝜈 𝜈), unless the model parameters are tuned to avoid that. The anomalies in the B → K(*) 𝜇 𝜇 decays can also be correlated with large effects in K+ → 𝝿+ 𝜈 𝜈, see here for an example. Finally, in the presence of new light invisible particles, such as axions, the NA62 observations can be polluted by exotic decay channels, such as e.g. K+ → axion 𝝿+. The K+ → 𝝿+ 𝜈 𝜈 decay is by no means the magic bullet that will inevitably break the Standard Model. It should be seen as one piece of a larger puzzle that may or may not provide crucial hints about new physics. For the moment, NA62 has analyzed only a small batch of data collected in 2016, and their error bars are still larger than those of BNL-E949. That should change soon when the 2017 dataset is analyzed. More data will be acquired this year, with 20 signal events expected before the long LHC shutdown. Simultaneously, another experiment called KOTO studies an even more rare process where neutral kaons undergo the CP-violating decay KL → 𝝿0 𝜈 𝜈, which probes the imaginary part of the effective operator written above. As I wrote recently, my feeling is that low-energy precision experiments are currently our best hope for a better understanding of fundamental interactions, and I'm glad to see a good pace of progress on this front.